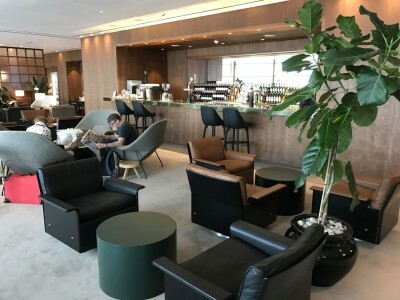 This is our review of the new Cathay Pacific lounges at London Heathrow Terminal 3. 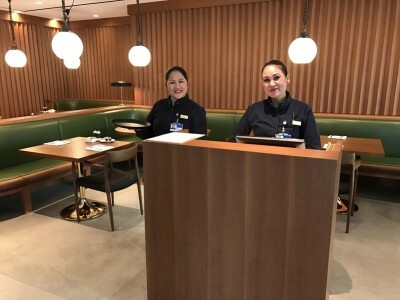 It took one year, but Heathrow Terminal 3 has finally got its new alternative to the British Airways lounges. And it was worth the wait. Last November the old Cathay Pacific lounge closed for expansion and refurbishment, growing into the space which used to be occupied by the Singapore Airlines lounge. After one year of work the new Cathay Pacific First and Business lounges officially opened their doors last Tuesday. 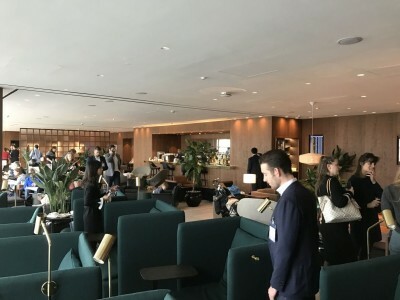 I went down to Heathrow Terminal 3 for the press launch to take a first look at both lounges, which are being managed by Plaza Premium on behalf of Cathay. 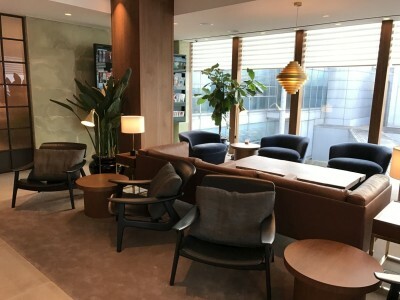 The new Cathay Pacific lounge complex has separate First and Business Class areas that can be accessed with your British Airways Executive Club card. 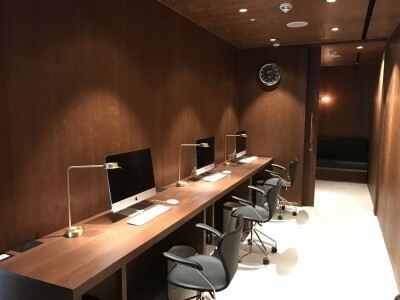 For the First Class lounge you need to have BA Gold or be flying BA First and for the Business Class lounge you must be BA Silver or be travelling on a Club Europe / Club World BA ticket. The two lounges share a reception and the bathrooms as well as the shower rooms are accessible by all passengers. This is where to head if you have a BA Gold card. The first thing you notice when walking into the First Class Lounge is how well lit it is. There are floor to ceiling windows for natural light during the day and various lamps. At the far back is a reading area with magazines. 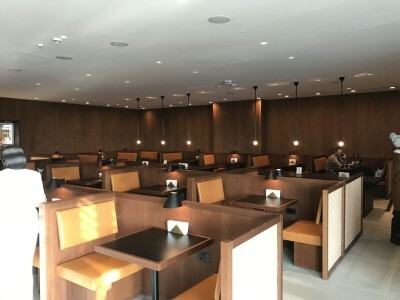 The First Class Lounge has got a dining room with all day a la carte menu. Here is the menu (click to enlarge). Without stating the obvious, you won’t be getting waiter-service fine dining over in Galleries First ….. 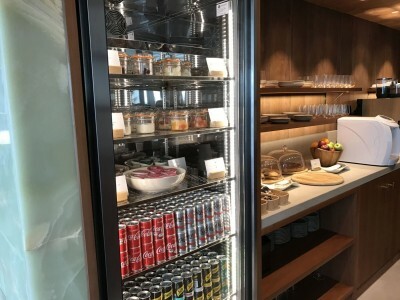 The self service bar has everything from spirits to wine and bottled beer as well as Carlsberg on draft and soft drinks. 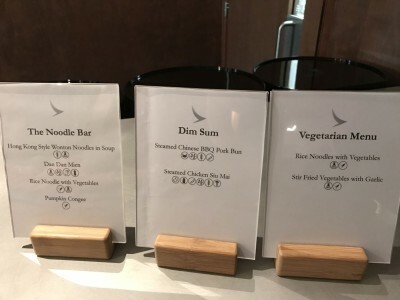 The British Airways lounge may actually have an edge here – Cathay doesn’t get everything right. 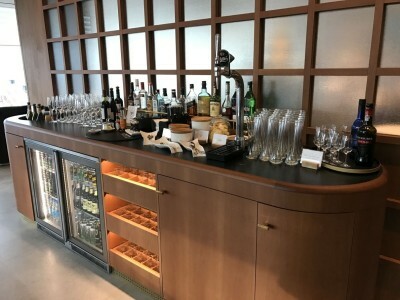 The First Class Lounge also has a snack bar. I was in the lounge in the morning and there were sandwiches, yoghurts and fruits. One thing Cathay Pacific Lounges are famous for is their noodle bars and this has been retained in the new lounge. I can confirm that the food is very good because I had champagne, dim sum and noodles for breakfast. And this was the morning after the Head for Points Christmas party ….. 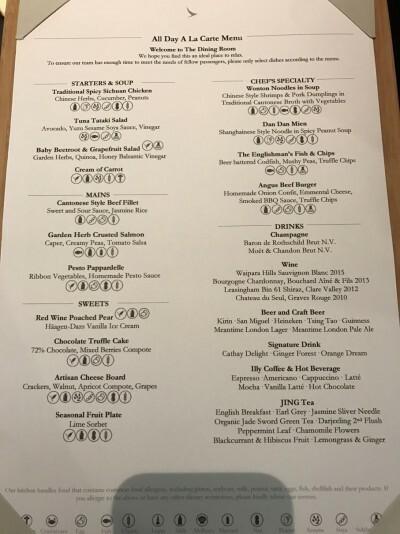 The menu isn’t as vast as in the First Class Lounge but has still enough choices including vegetarian options. 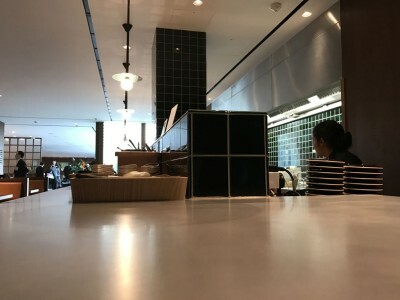 The restaurant area reminded me a bit of a posh Busaba without the communal tables …..
Every table has got two UK sockets with USB ports so you can charge your devices whilst eating. As you walk through the dining area, you get to a seating area with a bar. These green armchairs with reading lights are incredibly comfortable. This is the business centre with an accessible telephone booth at the far end. The shower rooms, stocked with Aesop products, are at the end of the hallway outside the two lounges. I didn’t manage to take a good picture of the shower itself, however there is a bit in the video below. I shot two videos whilst I was there to give a better impression of what you will find. If you can’t see the links below, you will find them on our YouTube page here where you can also subscribe to our channel. 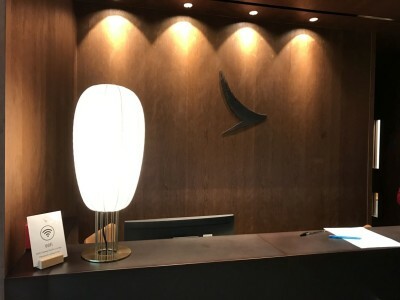 As Cathay Pacific is part of the oneworld alliance, British Airways Gold card holders and First Class passengers can access both lounges and BA Silver card holders or passengers travelling in Club Europe / Club World can use the business lounge. Both lounges are very impressive and, in terms of style and food, represent a massive improvement on the BA option. I recommend a visit to everyone on their next flight from Heathrow Terminal 3 – try to get in before the word gets around and all BA passengers start heading across ……. Looking forward to this. Have a F to LAS Next April and was really dissapointed with the BA F offering. nice – hard destination to get F availability to. how far in advance did you have to book? 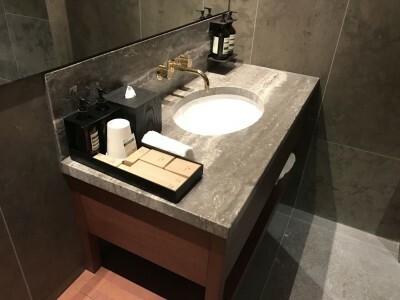 Is it possible to use both BA and CX lounges in one trip? I’m flying CW on Boxing Day and quite fancy using the BA lounge for an Elemis treatment, and then heading over to the CX lounge to eat/chill. Yes, not a problem at all – feel free to hop round any eligible lounges, although the AA one isn’t that great! Just saw your article before I boarded in EDI on route to LYS via T3. Only had 15 mins but called in to see the CX first lounge. My BA gold got me in no problem. I was the only one in there! Nice lounge but is a little small. Once the news gets out I think they will start to limit access. Looking forward to visiting the Business side next Friday, as a lowly BA Silver. Thanks for the video! OT – Just been sent an offer of bonus points from IHG on a purchase of points. Currently, being offered a total of 108,000 points for $690.00. Would this be considered a good deal under normal circumstances. Depends how you value them or if you have an upcoming redemption that you’re planning that would be at a much better rate – I agree with Rob at about 0.4p therefore I wouldn’t be a buyer at this price and USD exchange rate. I make this 0.5p per point. We’ve seen 0.4p recently IIRC. Value is generally considered to be 0.4p-0.5p. I wouldn’t buy at this price as I find IHG points fairly easy to pick up. And I’ve struggled to find decent redemptions over the last 12 months to be honest – might change now the pound has devalued though. I think you’ll unfortunately be forced to either go through Flight Connections (and thus onwards to T5) or to exit and therefore wouldn’t have a way to get into the T3 lounge. You could use the new AA T3 Arrivals Lounge if it’s open at the time you arrive though? Have read one recently, might have been on Miles from Blighty? Looks nice, worth a visit if you’ve got a long layover (then either HEX or underground for free to T5), rather than be stuck in Galleries First in T5 for ages. 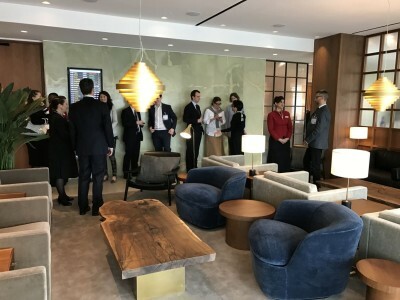 Are AA’s Executive Platinum (Emerald) holders welcome? Also just received an offer of 80% bonus points. Last week we bought yearly max for 100% bonus. Got to give them 10/10 for trying. I am there tomorrow – just depends how quickly we can turn around the video and review ….. Although some US airports seem OK with terminal hopping I don’t believe you’d be allowed through security at the wrong terminal or be allowed to change terminal once airside. Hehe yeah – not ever tried it at LHR but knowing security there I suspect it’s likely to be less do-able! I’ve done it at LHR a few times. There was (still is ?) an easy way to get through down corridors etc. but last time I think just went back through immigration ! That’s because Schiphol doesn’t actually have terminals, just “areas” of a single terminal. Read the FT thread where this post was shamelessly copied from with no credit (unlike Raffles) before proceeding. I’ll try. I don’t get time to read FT threads anymore. Looks like word has already spread – 4pm on Friday and it’s pretty busy in the business lounge – the only 2 seats together are next to a rather large and loud group from Essex (the accents and spray tans give this away!). Oh well, once we get back from Tallinn on Tuesday I’ll be gold, so can try out the F lounge next time!